The Trinity Athletics Committee (TAC) is the governing body for Trinity's Athletics Booster Club. The mission of the Trinity Athletics Booster club is to foster an environment that inspires athletes, students, coaches, parents, and the community to collectively create a positive and spirited atmosphere for all athletic programs. Our focus is to help promote integrity, camaraderie, and victory through community involvement, fundraising, and mentoring. Sponsoring Trinity Athletics not only helps your business gain exposure to Trinity's athletics community but also gives you the satisfaction of partnering with a local, non-profit organization that will help student-athletes further pursue their goals and dreams both on and off the court or playing field. For more information, click on the brochure to the left to download our full Sponsorship Proposal information. The Trinity Athletics Program is printed each season (fall, winter, and spring) to help support our athletics programs and local businesses. This unique opportunity will allow you or your business to place an ad in our Athletics Program that will be used throughout the school year at Trinity football, volleyball, basketball, and baseball games. Through the support of our community and sponsors, the Trinity Athletics Booster Club will be able to provide our teams with necessary equipment, specialized coaching, and scholarships to ease the financial burden of participation in Trinity Athletics and future college academics. Click on the link to complete your Ad Registration! ADVERTISE WITH TRINITY ATHLETICS & HELP A STUDENT-ATHLETE! The Trinity Department of Athletics and the Trinity Athletics Booster Club is proud to present an opportunity for Trinity families to grow and support our athletics programs at-large while also having an opportunity to subsidize their athletics registration fees. 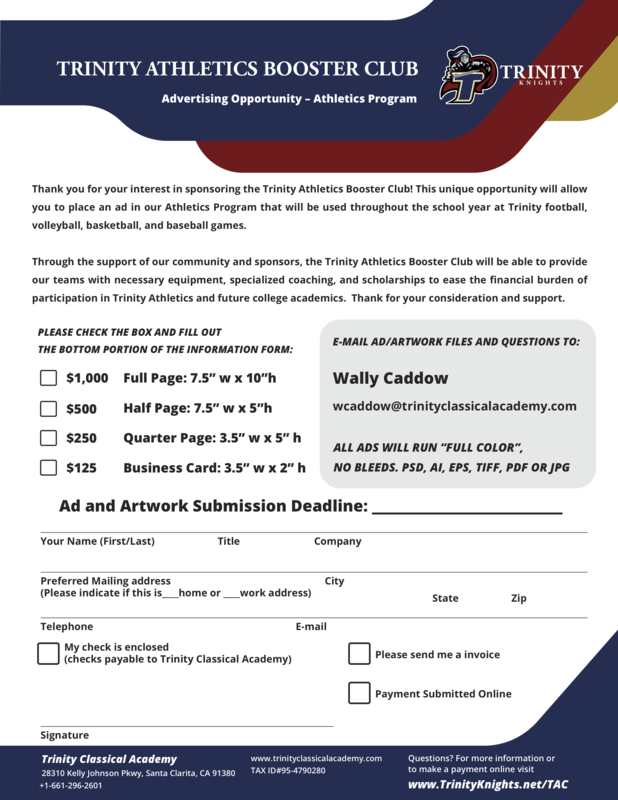 Students who sell ads on behalf of the Trinity Athletics Booster Club may receive up to 50% of their ad sales to go towards their athletics registration fees. This allows families to greatly reduce or possibly even cover their athletics fees completely based upon their participation. For sponsors purchasing an ad, please be sure to indicate (if applicable) which family or student-athlete was a part of your ad sale. Our student-athletes will then receive a credit towards their athletics fees—a win-win for families and sponsors alike!